The introduction of Basel III requirements may trigger consolidation among Russian banks as small and mid-size players race to comply with the new rules. The change could also give foreign banks a new entryway into the country. Vladimir Klimov, owner of a small bank in the Urals, has been wrestling over the fate of his business all year. By law, on January 1, 2014, Russian lenders must adopt Basel III international standards. To comply, Mr. Klimov’s bank must raise additional capital he doesn’t have. The aspiring young banker says he’s exhausted all but two options: either sell the bank to a deep-pocketed investor for little more than the value of its capital, or sell his customer base and return his banking license to the Central Bank. “The sale will be the lesser of two evils,” sighs Mr. Klimov. The adoption of Basel III in Russia, intended to increase transparency and head off potential future banking crises by forcing lenders raise capital ratios, may spark a wave of consolidation as owners of small and mid-sized banks sell out rather than face up to the new rules, according to Mikhail Kuzmin, executive director of the Center for Economic Research at Synergy University. The change may also create a new opportunity for foreign banks to snap up new assets in Russia, analysts said. After the collapse of the Soviet Union, small banks sprung up in Russia like mushrooms and foreign banks raced to enter the country with varying degrees of success. Today, while many of the smaller players persist, the scene is dominated by two domestic giants. 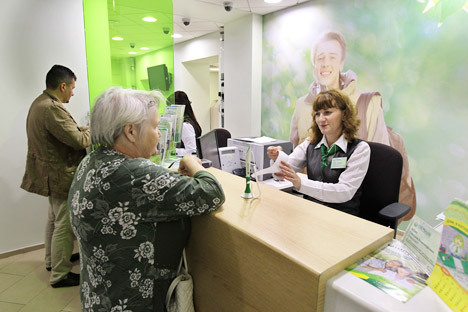 Sberbank, a revitalized incarnation of the Soviet Union’s national savings bank, accounts for almost half of the country’s retail deposits. VTB24, the former Soviet foreign trade bank, has about 7.3 percent of the country’s retail deposits, and has made significant moves into investment banking. This summer, Central Bank Chairman Elvira Nabiullina announced Russia would introduce Basel III requirements synchronously with the EU and US at the start of 2014. Under Nabiullina’s leadership, the Central Bank has decided to partially ease the requirements for Russian banks: Requirements for common equity will be set at the level of 5 percent, capital assets at 5.5 percent (with an increase to 6 percent beginning January 1, 2015), and aggregate capital at 10 percent. International firms like Citibank, Austria’s Raiffaissen and Italy’s UniCredit succeeded in establishing large operations in Russia. But other global players have found the country more difficult to enter. Britain’s Barclays acquired Expobank in 2008, but sold the unit for less than the buying price during the subsequent financial crisis. HSBC retreated from its retail banking operations Russia in 2011 as part of large-scale international reorganization, after only two years of effort. Big global banks still looking for an entry point into Russia may be able to take advantage of the current situation, as otherwise profitable regional banks look for buyers, said Pavel Loginov, Chairman of the Management Board of Metcombank. According to Russian law, foreign banks cannot open branches directly inside the country. But they are allowed to maintain fully-owned subsidiaries, making acquisition an appealing option compared to starting fresh. To be sure, many larger Russian banks are also said to be facing difficulty raising liquidity ahead of the new rules. According to Fitch, the international ratings agency, four of Russia’s largest banks in terms of assets will face a scarcity of capital – including VTB, Alfa Bank, NOMOS Bank and Russky Standart – as well as up to twenty medium-sized banks. Yet the biggest banks will be helped by their shareholders, primarily the Russian state or extremely high-net worth individual investors, analysts said. Small and medium-sized banks will have to survive on their own. Mr Chetverikov said he believes the introduction of Basel-3 could mean Russia winds up losing its medium-sized banking business sector in favor of the largest players and subsidiaries of foreign banks. “In contrast to the banking systems in Europe and the US, asset structure in [Russia’s] banking sector remains comparatively basic, without the critical dependence of bank capital on hybrid instruments. And, on the other hand, the balance sheet structures are from the financial derivative market,” explained Mikhail Nikitin, a credit analyst at VTB Capital. “Capitalization is higher in [Russian] banks than in European ones. Considering the higher volatility of the Russian economy and tempo of growth of the banking sector, our banks need to be stronger to match the level of risk,” said Svetlana Pavlova, Assistant VP at Moody’s.